Do your people want to explore and expand their creativity? Does your organization want its people to learn new ways of thinking? 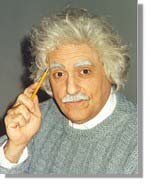 Using Albert Einstein as his paradigm shifter, Arden Bercovitz presents creativity as only Einstein can. His very unique way of looking at things challenges everyone to stretch their own imagination. His special perspective gives your audience new tools to approach problem solving, ideation and Thinking BIG. We have a distinguished tradition with a first class clientele in the computer, telecommunications, engineering, energy, financial and education industries. "Creativity," says Einstein, "is seeing what everyone sees and thinking what no one has ever thought." "Mega Results with Meta Thinking"